Big Data and Machine Learning — two phrases that most people have heard before. Fewer, however, can claim to understand exactly what it does and how it works. That’s H2O.ai’s specialty. They provide the algorithms and libraries for machine learning used by hundreds of leading companies from PayPal and Ebay, to State Farm and Cisco. Even if the terms “Big Data” and “Machine Learning” feel ambiguous, you’ve probably come into contact with their work before. Those ads that seemed a little too targeted? That’s thanks to Big Data. And those, “There may be fraudulent activity on your credit card” alerts you get from Capital One? Those were possible thanks to H2O.ai’s machine learning capabilities. In short, H2O.ai allows people and companies to make well informed predictions based on their data, and Marc Mastrocola, Director of Marketing Operations has aptly applied this philosophy to his own Growth Hacking technique. “I established a funnel that works to generate qualified leads to the Sales team and then I set up a process that the Sales team follows to turn the leads into sales,” says Marc. You might think that driving traffic to a landing page is the most important element of growth hacking, but in Marc’s well oiled, lead generating machine, intelligent follow ups have the largest impact on the conversion rate from lead to paying customer. Unfortunately, gathering the data that drives these intelligent follow ups can be difficult, as information from several cloud apps and a human data gathering process must all converge in one place. That’s where Workato comes in. Marc uses Workato recipes (recipes are a set of tasks that get work done across your apps) to automate his entire lead generation workflow. The recipes he’s created take unique information from 4 different sources (Intercom, Dropbox, Eventbrite, and Salesforce) and put into one place (Marketo) automatically. The workflow continues by feeding information from Marketo to an employee and back to Marketo, and finishes by pushing information into Slack by category. 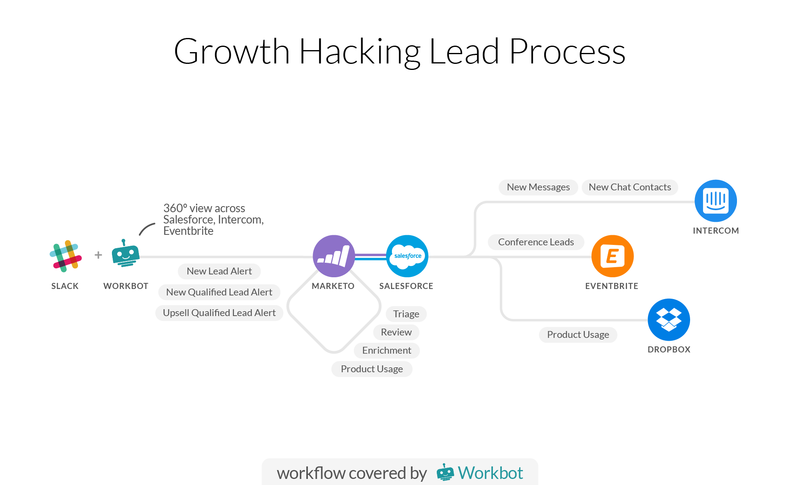 These actions complete 4 steps: Lead Sorting, Lead Cleansing and Triage, Keeping Track with Slack, and Using Workbot for Slack. So how does this incredible ecosystem work exactly? We’re excited to show you how Marc uses Workato to automate his team’s workflow, and accesses the workflow from inside of Slack using Workbot for Slack. Marc and his team gather leads from multiple apps — Intercom, Eventbrite, and Dropbox. The primary source is Intercom, an app you might recognize from the bottom right hand corner of many websites. Intercom not only gathers chat conversations with customers, but acts as a hub for all customer communication. Marc created two Workato recipes that intelligently move leads from Intercom and into his Customer Relationship Management (CRM) tool, Salesforce. Intercom Recipe 1: When someone signs up, it is logged into Intercom. Workato detects the new lead in Intercom and will automatically send the new lead to Salesforce. Workato will create a new Salesforce profile for the lead, but first it will check to make sure the lead doesn’t exist already, thus avoiding duplicates. If the lead does exist Workato will update the lead in Salesforce with any new information. Intercom Recipe 2: Any conversation with a customer/lead is logged in Intercom. Workato will send the conversation details to Salesforce and create a new note on the customer’s profile. The second major source of lead generation is H2O.ai’s annual conference — H2O World. Attendees gain access to valuable insight like how to build predictive models and run machine learning algorithms in Big Data Environments. Marc uses Eventbrite to sell tickets and needs these leads to sync into Salesforce along with any Intercom leads. This ensures he never forgets to follow up with a new lead without requiring any extra work on his end during the chaos of event planning. Eventbrite Recipe: When a new person registers in Eventbrite, Workato will check to see if that person exists in Salesforce. If they do not, Workato will create a new profile and then add the profile to a specific conference campaign that Marc created in Salesforce. With this recipe, the usage of their product gets added into the lead in Salesforce. This, in tandem with the next triage step below, allows Marc’s team to prioritize and lead score — ultimately deciding which leads deserve more time. Salesforce is now automatically up to date with any and all customer information — whether from Eventbrite, their own product, or Intercom — and is available for the customer service team to utilize. This automation not only makes the growth team’s job easier, but it also increases their efficiency, making sure they can leverage every bit of information about that customer. Because Workato ensures there are no duplicates or bad data, it is safe for Marc to link Salesforce with Marketo using their in app integration so his growth hacking team can make the most out of Marketo’s marketing automation features. The growth hacking team at H2O.ai uses Marketo to automate lead scoring, create landing pages and forms, and manage programs and emails. Though an incredible amount of information about each lead has already been transferred to Salesforce and synced to Marketo, Marc created a way to cleanse the leads and add further information on each lead using a native Workato app called People Task. Marketo Recipe: When there is a new lead in Marketo, Workato’s People Task will send a data cleansing request to an employee, Dianne. When Dianne fills in the information and clicks “approve,” Workato will update the lead with the new information in Marketo. Marc has asked People Task to request further information on each lead. First, Dianne will determine if this is a real lead or spam. Then she will fill in more information on the lead that will be useful for the team, such as the lead’s LinkedIn profile URL, their job title, industry, and city. This human review process not only cleanses the lead pool of bad leads, but enriches the available data. 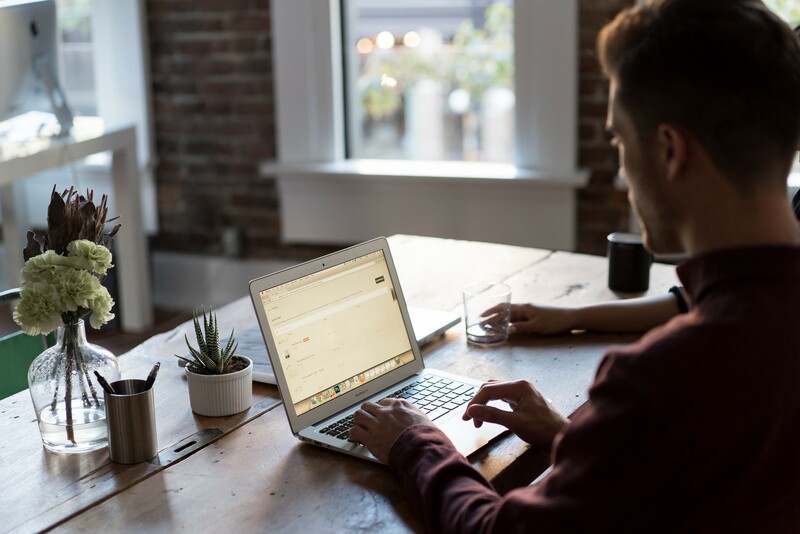 All of these preliminary pieces of information are things that a salesperson might individually research before a phone call, but this automates the information gathering process so that it is always on hand and digitally recorded for more powerful data comparison. Now that enough information has been compiled for a truly 360 degree view of H2O.ai’s leads, Marc likes to share their findings in Slack by category. Slack Recipe 1: When there is a new lead in Marketo, Workato will post a message to the channel “Leads” in Slack. Slack Recipe 2: When there is a new Qualified Marketing lead in Marketo, Workato will post message to the channel “Customer MQLs” in Slack. Slack Recipe 3: When there is a new Qualified Marketing lead for an existing customer in Marketo, Workato will post message to the channel “MQLs” in Slack. An extension of this workflow is to command it through the new Workbot for Slack. It takes Marc’s comprehensive growth hacking system and makes it commandable through the Slack chat window. Let’s say a member of the social media team messages Marc on Slack to tell him that a certain customer tweeted at H2O.ai wishing for a product capability. Without leaving Slack, Marc can make a note of it in Salesforce by simply asking Workbot to create a new note on the customer’s Salesforce profile. He can later use this information to upsell the customer. Workbot makes H2O.ai’s incredible integration ecosystem even easier to take advantage of. The workflow that Marc has implemented has supported huge growth for the company. In just 3 months, 4.6 thousand leads have been cleansed with Workato — a system that saves H2O.ai 5–10 hours every week. By utilizing Workato’s people task app and flexible recipe building platform, Marc’s team can use custom integrations to perform tasks like data cleansing and product usage recording without an IT team. By syncing H2O.ai’s cloud apps, Marc’s team is able to painlessly process hundreds of a leads a day. They use the full 360 degree view provided by the integration to make well informed and data driven decisions, ultimately converting the most leads to paid customers. So what’s the secret to successful growth hacking? It may be to hack into your own workflow first! Explore how you can use Workato to revolutionize your growth hacking workflow or shoot us an email at info@workato.com for a custom evaluation. The future isn’t A.I. or voice — it’s integration. We write about automation, bots, business apps, and business best practices.